The High Atlas Mountains, which dominate the skyline to the south of Marrakech, have always played an important role for the city, not least with regard to commerce. Whilst Marrakech is in itself a fascinating city, a whole new experience awaits those who venture south into the mountains. With several peaks above 4000 metres, the Western High Atlas is part of a larger chain of mountains that spreads from the Atlantic Coast in the west to Tunisia in the east. The mountains are home to the indigenous Berber people who have inhabited Morocco for at least 5000 years. The Berbers live in small clusters of earthen adobe houses which cling precipitously to mountainsides and are often only accessible by mule or foot. Our treks take us from the village of Imlil along footpaths and mule tracks which mount through the lush, irrigated terraces, apple orchards and walnut groves to other villages where you will have a glimpse into a way of life that has barely changed for centuries, and where traditional values and hospitality have been largely unaffected by the outside world. No reviews yet for this trip. Browse other reviews below for Mantis Extreme. Private transfer from Marrakech Menara Airport or your accommodation in Marrakech to Imlil (approximately 90 minutes) where you will meet your personal mountain guide and have the opportunity to discuss your preferences for walks and treks. Depending on your arrival time, there will be the option of an introductory walk in the area. Dinner and luxury accommodation at Dar Imlil will be provided. A day to relax and enjoy free time in the Imlil area, or a chance to explore the Imlil valley with your personal mountain guide. This can be separate morning and afternoon walks or one full day walk. Alternatively, you may wish to venture further afield to an outlying valley. A picnic lunch will be provided if required or lunch will be served at Dar Imlil. Dinner and luxury accommodation at Dar Imlil. A supported trek of 3-4 hours’ duration* with guide, mule and muleteer to our remote trekking lodge in the Azzaden Valley, a beautiful setting barely touched by the modern way of life. A picnic lunch en route with dinner and luxury accommodation at Azzaden Trekking Lodge is provided. You may wish to enjoy a relaxing hammam (steam bath) on arrival. After breakfast, a day to explore the stunning Azzaden Valley with your personal mountain guide. There are several treks of varying lengths to choose from. You may choose a moderate walk amongst the villages of the Azzaden Valley or a taxing 7-hour circular route passing the Lepiney refuge hut and the Tizi n’Tzikert col at 2930 metres, or indeed anything in between. Other options of a similar length include the slightly easier and very beautiful 7-hour circular walk passing the cols Tizi n’Teouti at 2450 metres and Tizi n’Tougdalt at 2700 metres. A picnic lunch en route will be provided on full day walks, otherwise lunch will be served at the lodge. Dinner and luxury accommodation at Azzaden Trekking Lodge. After breakfast, depart Azzaden Trekking Lodge and trek back to Imlil via a route of your choice with your personal mountain guide. A picnic lunch en route will be provided. Dinner and luxury accommodation at Dar Imlil. Private transfer from Marrakech to Imlil and return journey on day of departure. The services of a qualified guide and muleteer for the duration of your stay in the mountains. The use of a private hammam when staying at all accommodation in the mountains. All taxes include a 5% levy to the Village Association (further details on request). All accommodation approximately 1800 metres above sea level. 60km from Marrakech. Follow the road out of Marrakech towards the Tizi n’Test Pass and Taroudant and just beyond the town of Asni turn left following the sign to Imlil (17km). Stop at the village car park and go to the Kasbah reception in the village who will arrange for luggage to be transferred by mule. 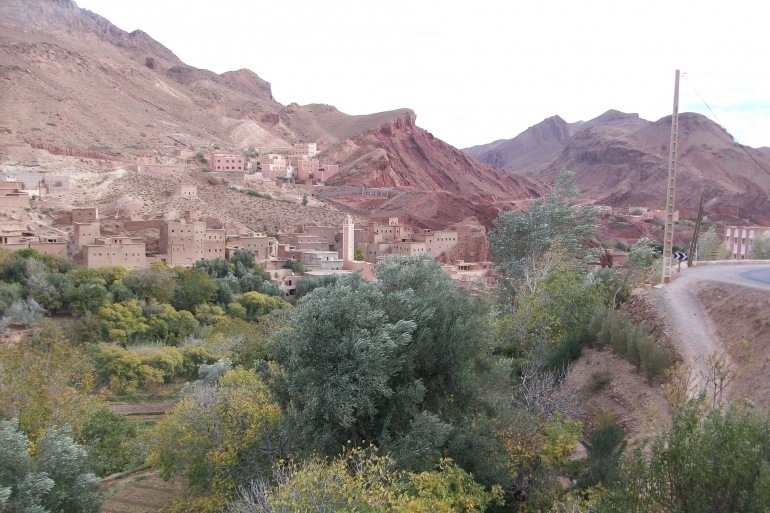 Kasbah du Toubkal can arrange transfers from Marrakech or elsewhere in Morocco.